Phoenix Aviation Limited of Gore has been operating for 44 years. This is a long time in the terms of New Zealand aviation operations and manager Barry Morton says it has survived because of "the company's fantastic clients, some of whom have been with us since the beginning." The company was formed after the closure of Rural Aviation 1963 Limited in 1968 when the late Peter Browne had the opportunity to buy from the wound-up company two Cessna Agwagons, at a very reasonable price. Peter Browne set about arranging for a syndicate of farmers and transport operators to buy these aircraft and form a new company to engage in a commercial aviation operation at Gore. In December 1968 Phoenix Aviation rose, like the phoenix of the Greek legend from the ashes of Rural Aviation 1963 Limited. This new company which included farmer, Bunty Grant and transport operator Bill Sutherland bought five Cessna Agwagons and operated over a large area of rural land south of the Waitaki River. The company flourished throughout the 1970s when southern farming was booming. A number of new pilots were trained over this decade including current company manager, Barry Morton, chief pilot, Brian Casey and retired Balclutha pilot David Renton. In 1971, Phoenix Aviation bought its first Fletcher 400 and four more were acquired over the next 10 years. In the 1980s farming subsidies were removed by the new Labour Government and have never been restored. This meant there was a sharp drop in the money available for topdressing and aerial spraying. Like all other such aviation companies at the time, Phoenix Aviation was obliged to cut back. However, the rural economy began to improve and Phoenix Aviation Limited expanded once again. However it was in the 1990s that company really moved forward buying out Des Pirie Ltd at Balclutha and Gary Langman's Agair Aviation Ltd at Gore. 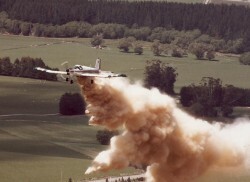 In 1996 Phoenix bought out Malcolm Hill's Turbo Air Services in Central Otago. The topdressing work in that region called for the use of turbo prop aircraft and after initially trialing a Cresco 750hp turbo prop, Phoenix joined with two other operators to form Turbine Conversions Limited. A type certification to convert existing Fletcher piston-driven aircraft to Czech Walter 550 hp turbo props was granted in 1998. Since then two such aircraft have been converted. According to Barry Morton these converted machines have performed excellently and efficiently for the company. As with most industries, aerial application development never stops with more efficient improvements taking place all the time to save farmers money and increase productivity. With the advent of the Global Positioning System (GPS) it only seems natural that such a pin-point accurate device would be incorporated into these aircraft supplying the pilot with a guidance system second to none. The online map display of completed swaths makes aerial application by Phoenix Aviation more accurate than anyone had ever previously hoped for. In March 1995 Phoenix Aviation Maintenance Ltd was formed to maintain Phoenix Aviation Ltd's aircraft, today Phoenix Aviation Maintenance Ltd not only maintains aircraft for Phoenix Aviation Limited but also for other commercial operators. Phoenix Aviation Maintenance Ltd also maintains aircraft for various aero clubs throughout the South. Peter Kempthorne the chief engineer estimates that over 40 aircraft are regularly inspected and maintained at the Phoenix Aviation hangar on the Gore Airfield. Peter has been to the Czech Republic where he undertook a course on the servicing and maintenance of Walter turbo-prop engines. In 2012 Phoenix Aviation has been operating for 44 years. It is the oldest surviving aerial topdressing company in the country. Today, Phoenix Aviation operates a modern fleet of Fletcher FU-24 s from their hanger and workshop at the Gore Airport and from Alexandra, Mossburn and Balclutha. Barry Morton says once again that the continuing and loyal support of the clients has been a significant factor in the longevity and high standing of Phoenix Aviation Limited of Gore.